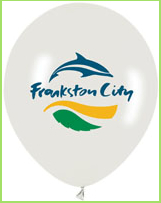 Balloons are a fantastic and low cost way to create attention to your logo, for trade nights, conferences and events. We also Have a full range of accessories. We can match your logo colours. if you wish to save money, then it is possible to print on different colour balloons, and use different print colours if desired, it makes an eye catching and colourful display, and it still relates to your logo colours. Use balloon colours that relate to your themed events, like Xmas parties, etc. 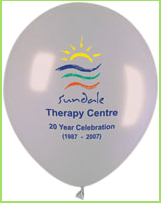 Balloons provide a great way to get your message across, message slogans can be printed on 1, 2 or 4 sides, or we can can even wrap the message around the balloon. 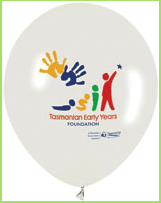 Promotional balloons delivered to Brisbane, Sydney, Melbourne, Perth, Adelaide, Gold Coast, Sunshine Coast, and all areas of Australia.